Professionals will have the opportunity to connect with top thought leaders and experience sessions designed to engage, inform and inspire, as well as further their careers against the backdrop of the industry’s global gathering. On Saturday, marketing, sales, and branding expert Scott Stratten addresses the “disruption” factor and how trust, connection, consistency and service to your customers are what wins in a hyper-competitive environment. Stratten will share “How to Win in the Age of Disruption” and deliver strategies and stories drawing on his own retail experience, his time in the music industry and how he has transformed companies ranging from Microsoft to Pepsi with powerful back-to-basics concepts. On Sunday, “Best in Show,” led by Upbeat Daily and Music Inc.Publisher Frank Alkyer and a panel of retail store owners and professionals will share their product picks from the Show floor. Following each Breakfast Session, the idea generation continues in the NAMM Idea Center. Phibbs will cover the top trends, including the new technologies, retail shifts and more shaping the customer experience, and offer solutions to scaling business to meet them. With more than 250 pro audio sessions dedicated to each aspect of production, emerging and established professionals have myriad options to grow in their careers. 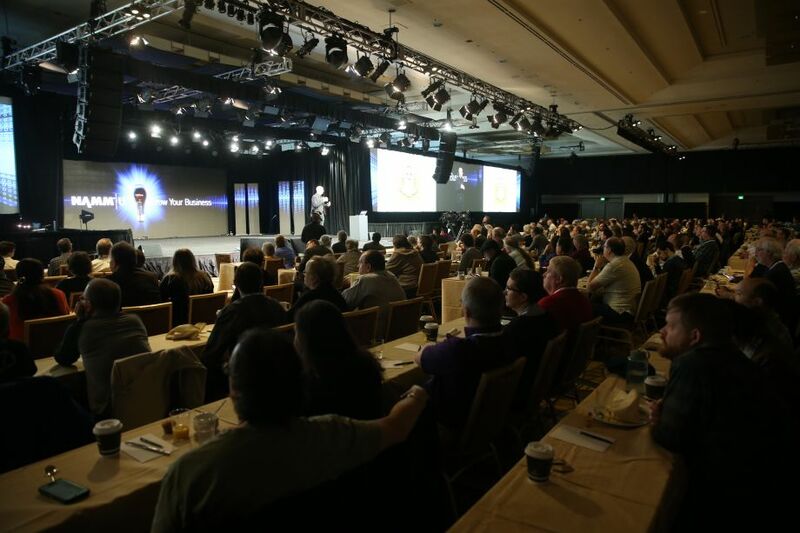 TEC Tracks will offer big-picture sessions to uncover topics ranging from building a profitable home studio to an inspiring keynote from engineer extraordinaire Chris Lord-Alge. TEC Tracks also brings together an additional who’s who of presenters, including Alan Parsons, Al Schmitt, Michael Beinhorn, Ed Cherney, George Massenberg, Eddie Kramer, Jack Douglas, Ross Hogarth and Frank Filipetti. View the schedule and register here (registration fee required to attend). For the future-minded, A3E: The Advanced Audio + Applications Exchange, dedicated to the future of advanced audio applications and new music technologies, will explore how advanced audio applications are transforming the music industry, production, and performance. A special keynote session, “Driving the Future of Music Production, with BT,” will explore the technologies to release the full creative potential of an artist and what happens when the barriers are removed to limitless innovation. A3E will welcome Intel and visionary artist BT for the session. “The Art of Artificial Intelligence: The Science of Creative Tools” and many more. On Thursday and Friday at the Show, Audinate, the maker of the popular multimedia networking technology Dante, will offer a two-day Training and Certification for its popular Level 2 Dante certification courses. The hands-on experience will let attendees have a synchronous, practical experience with Dante as they are learning basic Dante concepts. These training sessions will begin with an introduction and demonstration of Dante AVIO adapters, followed by Dante Certification Level 2 hands-on experience. A suite of sessions for event technology professionals, curated by ESTA (Entertainment Services and Technology Association), along with The Pro Production Sessions presented by Front of House and Projection Lights & Staging Newsmagazines, and Lighting & Sound America/PLASA, will offer professionals a range of best-in-class education and credit opportunities. ESTA will host four tracks in Lighting and Electrical, Lighting Networking, Rigging, and Safety, all offering the opportunity for free Entertainment Technician Certification Program (ETCP) renewal credits. ETCP certificants can take advantage of the 80 available renewal credits, while beginner, intermediate and advanced topics in each subject area are offered for free to all NAMM Show attendees. Richard Cadena, Steve Adelman, Paul Sapsis, John Huntington and Steve Terry will be among the leading presenters in the ESTA-curated education program. The Pro Production Sessions, presented by Front of House, Stage Directions and Projection, Lights & Staging Newsmagazines, will bring the leading names in entertainment production together to offer a more in-depth look into iconic projects’ designs and the forward-looking trajectory of production technology during keynotes, single speaker and panel presentations. The best of the best working today explain the highs and lows of an industry career in production and discuss how the different roles in the industry create the stage environments that support the musical artists’ work and the audiences’ experience. This is the opportunity to learn from best in the business, including many Parnelli Honorees, along with a who’s who of designers, manufacturers and industry leaders. The Nonprofit Management Institute for the Foundation’s partner and grantee organizations, presenting the best practices in nonprofit administration. View the complete education schedule here. All professional development sessions will take place at the NAMM U Education Center at the Hilton Anaheim, located next door to the Anaheim Convention Center, with the NAMM Idea Center located in the lobby of the Anaheim Convention Center. AES@NAMM requires a registration fee, with all other sessions open to NAMM Show attendees. For further information or to register for a badge to attend, please visit NAMM.org.